From small molecules in DMSO to biomolecules in surfactant-containing aqueous solutions, this convenient benchtop solution allows rapid delivery of any volume to any well. Requiring almost no set-up time, it uses disposable Dispenseheads to minimize dead volumes and virtually eliminate the risk of cross-contamination, offering high quality, low volume dispensing for a wide range of applications. Do you want to see how digital dispensing works in practice? Schedule an online software demo! Are you tired of manual pipetting? Presenting the way to make serial dilutions obsolete. Set up your assay by dispensing directly from the stock solution – now you can use different plate formats up to 1536 wells! Take advantage of our dedicated software wizards for dose-response, synergy, PCR or enzyme profile experiments. Finally - normalize and randomize the layout to improve reliability of collected data. 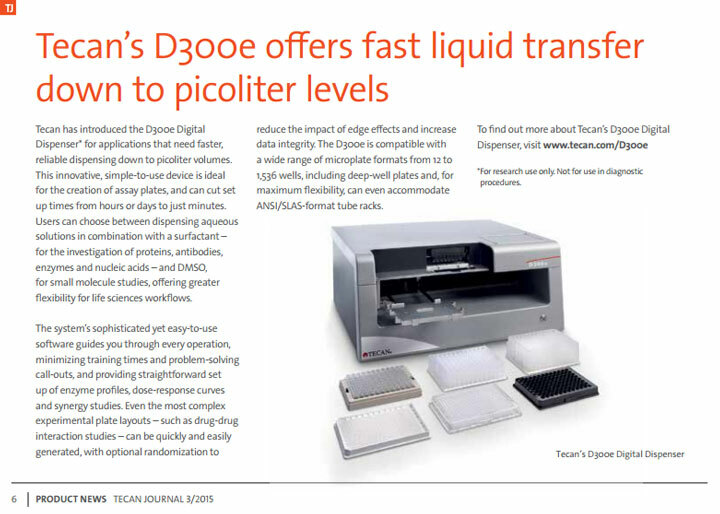 Find out how Tecan D300e can save your day in the lab! Create any plate map and dispense any dose in any well. Even randomize the plate with only one click! The Tecan D300e's software is so simple to use that one can create any plate map desired in only minutes! Use your time more efficiently in follow up studies. D300eControl software makes it easy to generate dilution series, leading to more precise determination of Hill slopes and IC50 values. Minimizes manual pipetting, enabling scientists to focus on more important tasks and reducing repetitive strain injuries. Enhances throughput with simple, yet sophisticated, software and application-focused wizards. Automatically calculates all concentrations and volumes for faster, simpler plate set-up. Dispense your reagents directly into your assay plate and onto your cells. The Tecan D300e’s PCR wizard makes it quick and easy to set up (q)PCR reactions in just 4 guided steps. Miniaturize your reaction volume and save on reagents and precious samples. The Tecan D300e’s Enzyme Profile wizard makes it quick and easy to set up titrations using differing combinations of enzymes or substrates in aqueous buffers, and inhibitors or other small molecules in DMSO. In vitro drug combination studies are becoming more and more. The Tecan D300e, due to independent dosing of each compound and a software wizard, finally makes it possible to execute these experiments with ease. The Tecan D300e makes long, laborious workflows possible to standardize. This technology removes the need for many wasteful steps, getting to results faster. The system’s powerful software combines advanced experimental design with intuitive operation, allowing you to set up a wide range of experiments – including synergistic studies and randomized plate layouts – in minutes, saving you time without compromising on quality. Join this webinar to get more information about synergy experiments. Repetitive manual pipetting and tedious serial dilutions for drug discovery assays just became a thing of the past. With Tecan’s D300e Digital Dispenser, you can automatically dispense any volume into any well of any assay plate, quickly and easily. Simply add your liquid to the Dispensehead and let the instrument do the rest. The data presented in this application note demonstrates that the D300e can be used to miniaturize qPCR reactions to volumes as low as 2 μl and in addition offers greater process security and speed of the automated set-up. The application note shows that the D300e is a suitable tool for qPCR set-up, offers significant sample, primer and reagent savings, and greatly reduces workflow time. The data presented in this application note underlines the suitability of the D300e for protein-based assays. The results generated with the D300 are consistent with an expertly performed manual process, but with the benefit of significant time savings and the elimination of serial dilution. This technical note demonstrates, how easy it is to generate even the most complex plate layouts, like enzyme profiles, with the D300. AstraZeneca scientists engaged in surface plasmon resonance studies are reaping the benefits of a recently acquired HP D300 Digital Dispenser, saving time, enhancing consistency and using significantly less compound for dose-response experiments. Tecan has worked with promega to demonstrate the suitability of the Infinite® 200 PRO and HP D300 Digital Dispenser for real-time kinetic investigation of cytotoxicity using Promega’s CellTox™ Green Dye. The Stanford genome Technology Center has invested in an HP D300 Digital Dispenser to study the effects of small molecule chemical inhibitors in yeast, enabling more experiments to be carried out more easily, and in less time. 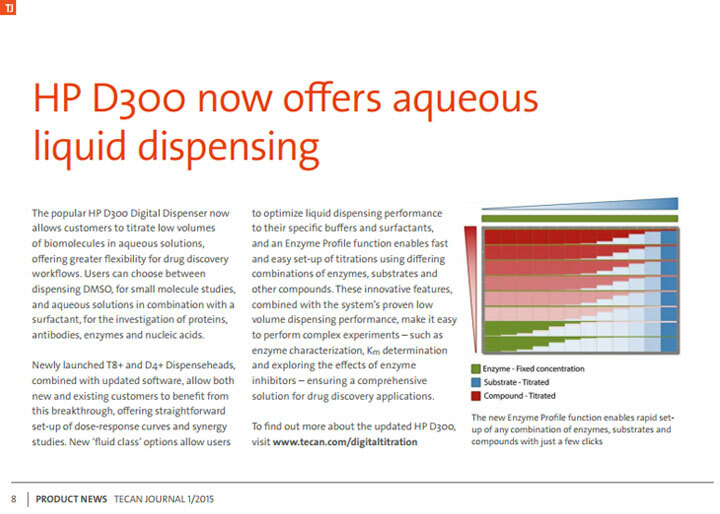 In the last issue of the Tecan Journal, we announced the availability of the revolutionary HP D300 Digital Dispenser exclusively through Tecan’s Life Science Business. As customers in Europe and North America begin to place their orders, Kevin Peters, HP Global Sales Development Manager, reports on early customer experiences with the new technology.